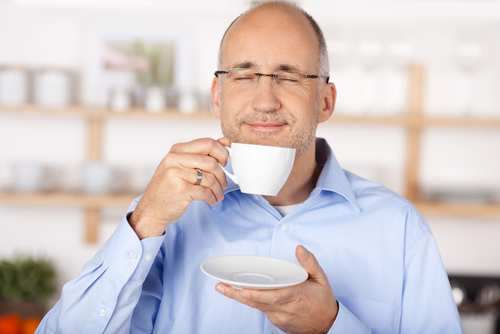 Ah, the smell of coffee! You can thank your olfactory bulb. Ah, the mouth-watering scent of freshly baked bread and the intense aroma of roasted coffee beans. You can thank nerve cells in the front of your brain — in direct contact with your nasal passages — that convert odor molecules in the air into brain signals and generate your perception of those wonderful smells. Loss of the sense of smell is often one of the earliest symptoms in people stricken with brain disorders such as Parkinson’s and Alzheimer’s. So the study of this part of the brain called the olfactory bulb, that’s responsible for smell perception, is an attractive area of research that could help provide insights into fundamental brain function and its connection to neurodegenerative diseases. Last week, scientists at the National Institutes of Health (NIH) moved the field a step forward by reporting in the Journal of Neuroscience that brain stem cells play a vital role in sustaining the proper brain cell circuitry in the olfactory bulb. Studies in adult mice have shown that brain stem cells deep inside the brain have the uncanny ability to travel to the olfactory bulb, transform into nerve cells, and set up appropriate circuits with surrounding nerve cells. The NIH team had previously demonstrated that when a nostril is plugged for 20 days in these mouse studies, depriving the olfactory system of stimulation, the nerve cell connections scatter and become very disorganized. But after removing the plug for 40 days the proper connections and patterns are re-established. 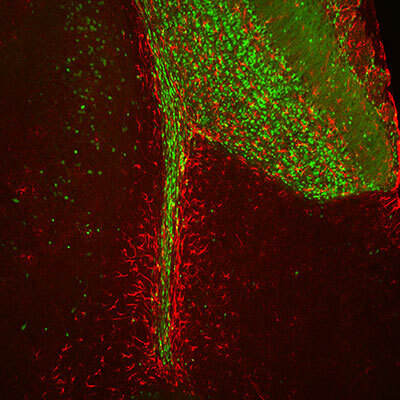 Newly born nerve cells migrate along a thin path and connect up with surrounding nerve cells in the olfactory bulb, the large structure in the upper right. (Image credit: Belluscio Lab, NINDS). Even when the brain stem cells were eliminated in mice that were not given the nose block, a deterioration of the olfactory bulb nerve cell network was still observed by the research team. These results turn scientists’ understanding of brain circuits on its head: rather than being mostly stable structures, in this case the olfactory brain circuits appear unstable by default and must continually receive new neurons (from stem cells) to not only restore disrupted connections but also to preserve stable circuits. To hear more from Dr. Belluscio about these results, watch this video interview. And for more about the role of stem cells in adult brain circuitry, watch this seminar by UCSF researcher and CIRM grantee Arturo Alvarez-Buylla, PhD.